When we start our TWO School classroom sessions for the Level One students, we talk about throttle control as the essence of riding well. For the 20th anniversary, I thought it might be useful to talk about this concept in detail. To be able to understand why we think of this one skill as the centrepiece of riding better, being safer, going faster than we've ever gone and leaning over further than we ever have before, in corners. All of those things and more, come from good throttle control. One of the biggest reasons why throttle control is so essential, is because of the chassis of your motorcycle. That means the frame, the suspension, the brakes, tyres and wheels. These are designed together to produce a motorcycle that does a specific job - like a sportsbike or an adventure tourer. When we read the specification for these bikes, we see things like wheelbase - the distance between axles. The steering angle, rake or caster - the angle that the line from the steering head to the front axle makes, with a vertical line. We also look at the trail - if you were to draw a vertical line through the front axle, the trail would be the distance on the ground from the centre of the front tyre's contact patch to where the line touches the ground. In short, a long wheelbase suggests a motorcycle that favours stability and doesn't want to turn. A big caster angle, like say 31° also suggests a stable motorcycle that likes going straight on. Sportsbikes will be something like 24°. A long trail figure, says 100mm, is a motorcycle whose front wheel doesn't want to stray from the straight and narrow. And returns to it as fast as possible. But the thing of it is, that these numbers are at rest. They exist so you can compare bikes. To fill the specification sheet, as it were. When you merely sit on the bike, you compress both the suspension units. You also squash the bike a microscopic bit with your weight. That changes all of the numbers slightly already. When you start riding - accelerating, braking and turning - your inputs continuously modify those numbers some more. On its own that doesn't matter. But these numbers define how your bike feels to ride. And no one can ride a motorcycle well that goes from being a cruiser to an adventure tourer to a sportsbike every quarter of a second. The reason why throttle control is considered such an essential skill is because many of the changes in rake-trail-wheelbase originate in your throttle hand, and your brake fingers. But since we brake barely 2-3 per cent of the time, throttle control is vastly more important to master. Consider what happens to the bike when you open the throttle down a straight road. The centre of gravity falls behind its normal position due to inertia. This changes the load on both tyres, adding weight to the back and taking weight of the rear. This manifests in suspension movement too - the rear spring compresses while the front forks extend. That means a longer wheelbase and slower steering from a more relaxed caster. Now imagine you've closed the throttle, or are braking for a corner. Now the centre of gravity - under the influence of inertia - continues forward while the motorcycle slows. This loads up the front tyre and takes weight off the rear tyre. The front forks dive and the rear spring extends. Now you have a shorter wheelbase and a more agile caster setting. This is why most riders feel great confidence when they're going down a straight road - the motorcycle tends towards stability and your fear triggers are sleeping. On the brakes and when turning, the motorcycle trades in stability for agility and that also means instability is closer and more of your fear triggers are awake. Once we know that the suspension movements cause differences in the way the motorcycle behaves, shouldn't we be able to control these changes? Or better still, use them to our benefit. For example, what if we could make the motorcycle stable when it feels too agile or unstable? Like in the middle of a corner. Or make it extra agile when we need to change direction? Welcome to the world of throttle control. This is what it's about. Throttle control is the skill that permits us to use the natural flexibility of chassis geometry to create an agile or stable motorcycle at will. And almost all of this work is done by your right hand. What does throttle control do? As we saw, and open throttle creates a more stable motorcycle. And that stability promotes your confidence. Confident riders make better decisions and go faster. So the intent should be to have the throttle opening more places right? 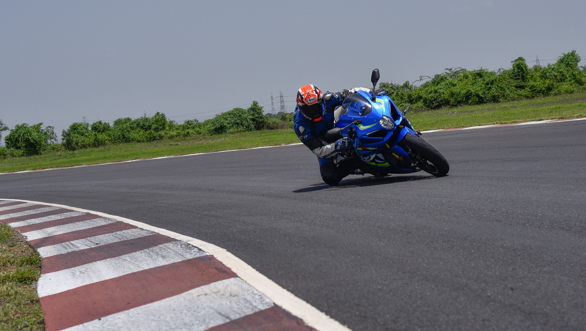 The first thing that throttle control does, is change the way you approach your path through a corner. Good throttle control means finding the path that requires you to be off the throttle for the shortest possible time. Now consider what happens when you're in the turn but the throttle is open positively - think accelerating at a lean angle, even if gently. You'll notice that the motorcycle wants to stand up a bit. Basic physics. If the motorcycle were going at a fixed speed at a fixed lean angle, it would make a clean circle. Add speed and the circle widens. Or you need to add lean angle to keep the circle in the same place. So if the motorcycle were accelerating gently at a lean angle, it's going to feel more stable. But it also lifts up a little. That's crucial. It means the chances you will deck your pegs reduce. It means you're on a part of the tyre that will handle the loads from the lean angle and from the acceleration better also. Extended front forks also have a better chance at absorbing the bumps, always a bigger challenge when the lean angles are greater. If you think about the influence of good throttle control on your line in the corner, you will see that when you reduce the amount of time you spend off the throttle, you simultaneously cut both the time you spend at big lean angles as well as in an unstable state. Going faster isn't always about risk appetite. If your riding buddy has better throttle control than you, he is able to access a more stable motorcycle than you, more often and in more places. That's how s/he's going faster than you but looking smoother and safer as well. Smoother? Yes. Imagine opening and closing the throttle repeatedly in the middle of the corner. The suspension would bounce around, the loads on the tyres (and hence their grip level) would change and that would make you uncomfortable and nervous. The essence of throttle control is to not only control agility-stability but also to reduce the variation in suspension movement as it reacts to the weight transfers your control inputs generate. If you look at the forks and springs moving in the middle of a corner in the hands of a good rider, you will find hardly any movement. Their throttle hand is working small, slow-paced adjustments so that the suspension barely moves and the tyres can get on with doing their jobs - driving you forward. This smoothness is a desirable quality because again, it will do wonders for your confidence, your pillions will love you and guess what, you might actually get better economy as well! How do I learn throttle control? We have a series of exercises for you at the school but there are a few things you can try on your commute. First, when you are riding to work the next time and find yourself in slow moving traffic, get into first gear. This is the most reactive gear and will magnify your mistakes. What you want to practice is the ability to extend and compress the front forks without jerks as you accelerate and slow down to match traffic around you. It won't be easy, but you'll see how little and how slowly your hand has to move for this. And those slow-moving hands don't mean a slow motorcycle. Second, the next time you're out on a mountain road you know well, try this. Try to ride each corner as you normally do but mentally focus on your right hand. You want it to open the throttle smoothly and progressively once you have decided that it is time to open the throttle. This requires focus and concentration which is easy at the racetrack - be careful out there. Clear roads are essential to this, don't try to practice this if the corners are busy. Third, learn to find what many call maintenance throttle, naturally, and as quickly as possible. Maintenance throttle, to put it simply, is the small amount of throttle needed to keep the motorcycle at its current angle. When you turn a bike - with the throttle closed - you steer and it starts falling to lean. Maintenance throttle is how you add enough speed to maintain the curving line. Once you learn the small wrist movement, you can allow the bike to fall to deeper lean angles with more confidence when you need to. A smooth motorcycle that doesn't react or jerk feels awesome to ride. Throttle control is essential to this process. But what it does, in essence, is boost your confidence and sense of control over the bike. Which means you can ride faster, be safer, have more mental space to process what your senses are telling you and therefore, make better decisions. More importantly, this confidence also allows you to corner faster, enjoy bigger lean angles and have a better time in the saddle. 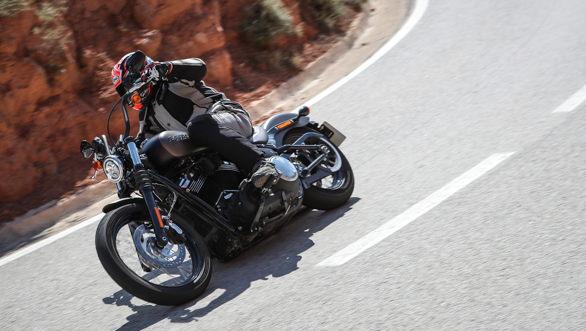 Great throttle control is not just about how your hand moves. It is heavily influenced by what your eyes see and how your brain interprets that data. 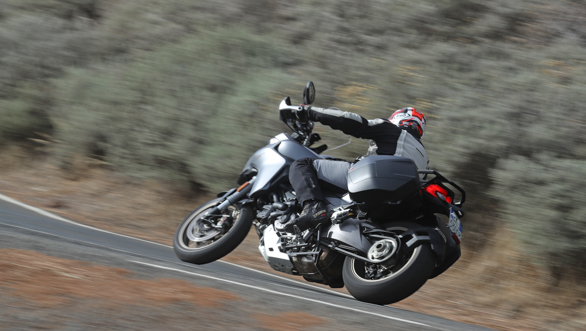 The TWO Track School by Indimotard and OVERDRIVE's Level One program focusses on these skills and over the last 10 years, we've helped over 1,500 street, track, commuting and touring riders find better control over their bikes so far. The skills apply equally to all kinds of motorcycles and if you haven't tried it, I strongly suggest you should!